After spending more weekends than I can count running around in the snow and mountains I found myself exhausted and needing some rest. Brian wanted to get some work done on our condo which meant we needed to spend a weekend elsewhere. 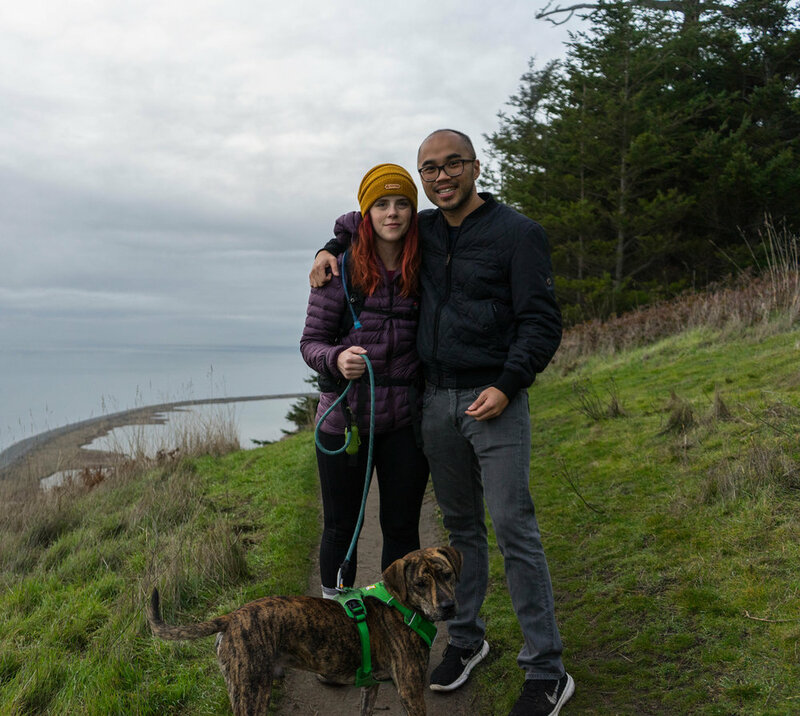 The stars all aligned and we were able to get away to Whidbey Island with some close friends and our pup for some much needed relaxation! First thing, our vacation rental! This place is a dream come true! It’s the type of house I dreamed of owning as a kid. It’s right on the water and the windows in the kitchen, living room, and two of the bedrooms open up over the Sound. You can sit in a cozy chair and read while looking out at the water aka a dream come true for a bookworm like me. We left the blinds in our bedroom open for the entirety of the weekend so we could wake up to pale pink sunrises. It definitely had my sunrise simulating alarm clock beat! View from the kitchen when you walk in! 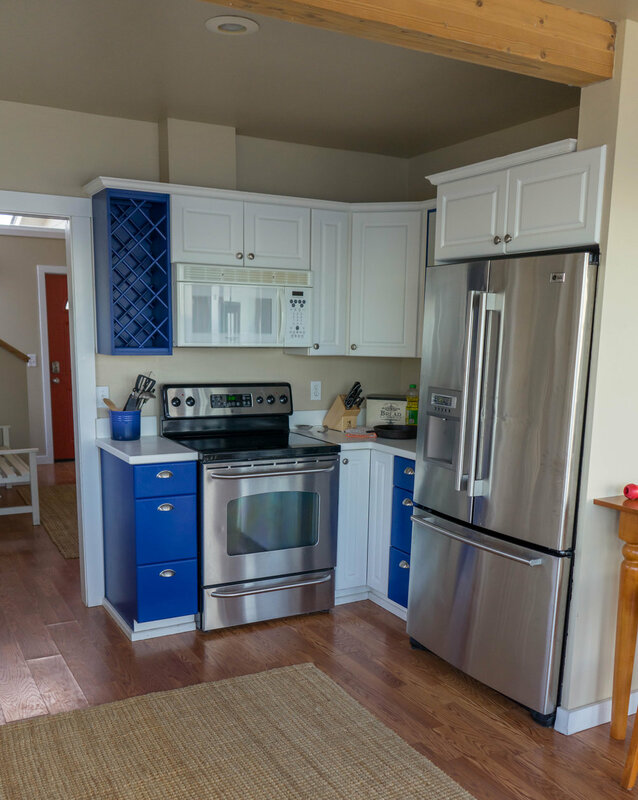 The kitchen is great and we were able to make some great meals in there. We went out for brunch in Coupeville one morning and wished we had just stayed put and made our own brunch! There are three bedrooms and one has an adjoining bunk room if you bring little ones along and want to have them sleep nearby. I wanted a relaxing weekend, but it wouldn’t feel right if I didn’t go on a single hike during a weekend away! There are a few different places to explore on Whidbey Island. One of my favorites, Deception Pass State Park is nearby, but I have explored there many times since I grew up in the area. I did a little searching on WTA and found Ebey’s Landing instead. It’s a relatively easy 5.6 mile loop hike on a bluff overlooking a beach. We started down by the water an hour before sunset and made our way up to the bluff overlooking the beach. At first the weather looked AWFUL. There were rain clouds everywhere and they seemed to be heading our way. I was hoping to shoot a sunset so I was a little bummed to see such poor weather. Stormy grey skies to start out the hike. As we kept hiking the clouds suddenly started to light up. We were at the part of the hike that heads down to the beach and needed to make a decision on whether to continue down to finish the loop, or go back along the bluff towards the pink sky that was lighting up behind us. I loved the way the sky was looking from the bluff so I elected we stay up there, and I am glad I did because I was able to get some great shots with my new camera! So happy to witness such a beautiful sunset! The rest of the weekend was spent in the house relaxing and reading...okay and maybe a little bit of poker and drinking ;) It was a perfect weekend away and I can't wait until we can do it again! The owners of our Vacation Rental have graciously offered $100 off for anyone reading this blog post. Just mention Seattlebred when you request to book and they will give you $100 off your stay!